Did you know that regulators are pushing for faster electronic payments for all Americans by 2020? Though Americans are still writing billions of checks per year—2.5 billion, to be precise, according to market research firm Aite Group—financial institutions across the country are helping their customers switch to electronic payments with CheckAlt’s LoanPay. LoanPay seamlessly integrates with financial institutions’ online banking platforms, allowing customers to choose convenient card and checking account payment options for their auto loans, mortgages, business loans, and more. One of those options is to pay by eCheck. Our eChecks are electronically created items with no paper origination, as opposed to a paper check that is then converted into a digital file using remote deposit capture. To pay by eCheck in LoanPay, a payer simply enters their checking account information and selects that account when making payments. Payers can set up one-time or recurring eCheck payments in LoanPay, from any internal or external checking account. Our technology then takes the checking account and payment data and creates a digital front-and-back image of a check. Each eCheck payment is processed using the Check 21 rails for faster, cost-effective transactions. Once the payment has cleared, the eCheck will appear on the payer’s next bank statement as an image. These eCheck images offer more context to payments than card payments (shown as nondescript, alphanumeric lines of text) or paper check images. eChecks created using LoanPay provide four memo lines—two for the payer and two for the financial institution. Additional memos might include an invoice number, a website URL, an email address, and more. This transparency helps further simplify payment reconciliation. LoanPay’s customizable features give financial institutions control over how they serve their unique customer base. For example, financial institutions can set up LoanPay to give customers management access to multiple loan accounts from a single login, making it simple to schedule many payments at once. LoanPay is designed for the future of payments. Save time and money associated with paper check payments. 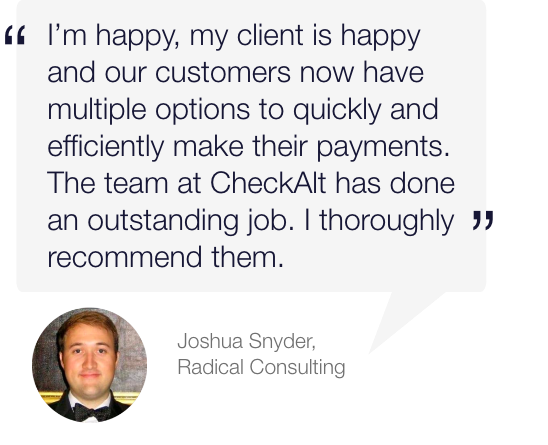 Contact us for a demo to learn how CheckAlt’s LoanPay solution can help your financial institution. © 2018 CheckAlt. All Rights Reserved.